However, i got some errors like below. i installed appium by npm and of course i installed node. Hope can get some help on this case. Once again, you may need to use google search if your IDE is not Eclipse. Hopefully one of these will help you. @wreed Thanks. Like you said, i am using Eclipse to run these tests. i am going to take a look the instructions for eclipse. And As you can see in attachment, once i got the correct path, can i just type code like below ? 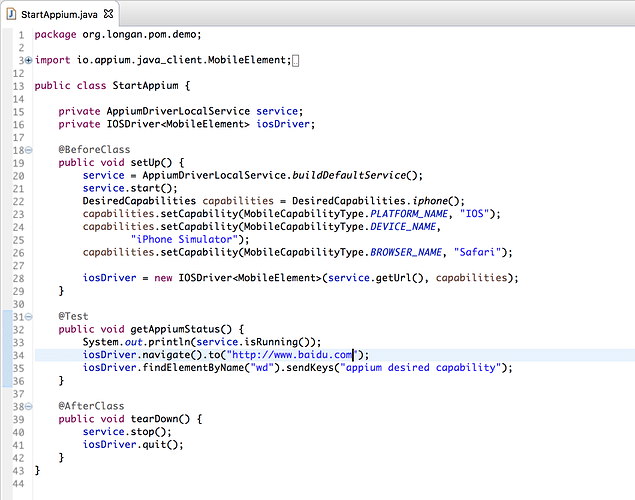 Once you have the path set in Eclipse you should be able to start Appium properly. You’ll probably always have to set the URL. Thanks @wreed, i am trying to reference below issue to start appium by programmatically and set AppiumDriverLocalService. One more thing please, i still don’t understand why we need AppiumDriverLocalService ? When should we use this object ? But AppiumDriverLocalService is a new feature implemented by appium guys in java client 3.2 to start appium server using appium library itself instead of using JAVA. so wreed is basically saying when you use this new feature it is must to have node.js to be installed on u r system. same error you are getting. So first install node.js on your system then you can try with below code. It works fine on android for me. In this way appium library just wants to know where is node.exe in u r system and where is appium.js file in ur system. appium.js file will be inside the appium server you downloaded and node.exe will be in programfiles like other installed programs. Another question on this, what about if i want to assign a nodeConfig file to the appium server ? Would you please help to give me some example or some hints ? Do you have any idea on how to assign nodeconfig file to appium by AppiumDriverLocalService ? can assign a configuration file. Appreciate for your help on this topic. Are u using grid nodeconfig.json file using this option ? So for grid you used this code multiple times to register a node to a running grid HUB ??? Yes, i register appium as a node to Selenium Grid. The grid is the HUB. But i don’t try it multiple times. Is there anything wrong on this ? I got below error when I try with the @suroit code. As per the console error, it is saying ideviceinstaller is not installed on mac. But I have installed and it is alreary exist in my mac. Could u please help me to get rid of this errors. …6minfoe[39m: [debug] Dynamic bootstrap code: // This file is automatically generated. Do not manually modify! There are many more like it a mere google search away. Please use the way I explained in method-1 in my post, it will help you. I am getting below error while starting appium server using above method. It would be great, if you can help to solve this issue. Hi, I got the error while following the same approach.